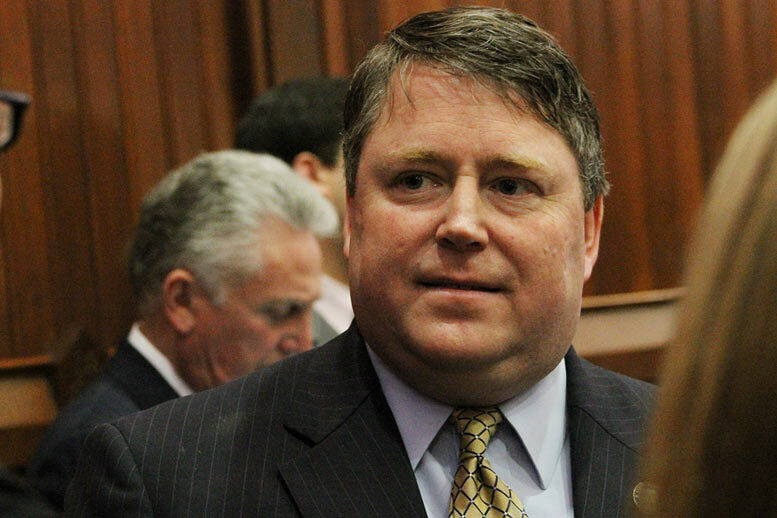 Surprise, surprise, State Rep Dan Carter actually responded personally to my request for more information (read here) before I considered donating to his reelection campaign. 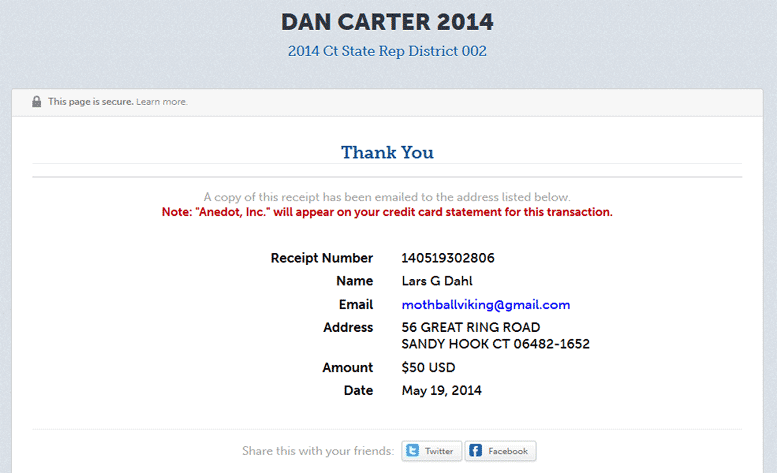 I found his answer to be on point and satisfactory, and I will, in my first ever contribution to a political campaign, donate a small sum to Republican rep Dan Carter’s reelection campaign. His donation page is here. The honest truth: you contacted me during the gun debate last year. I figure you are probably supportive of the way I voted, so I am looking for all the help I can muster. The manner in which the law was passed last year was a complete disgrace to our system. The plan was to have a true bipartisan effort to look at legislation that could be passed quickly and benefit our state, while leaving more controversial issues to the normal committee process. Unfortunately, the process was quickly hijacked by members in the majority who had long standing agendas. This type of legislation should NEVER be put through the emergency certified process. I am the only member of the Newtown delegation to vote against the legislation. I won’t lie and say I didn’t feel the pressure, since people I had genuinely respected wanted me to vote for the gun bill and the anti-gun groups in Newtown and Redding were all over me. But, I am serving in office to do my very best to make decisions that are best for my constituents by supporting good, well-thought-out policy. The bill passed last year has no chance of saving a life. It only creates a costly system that affects the people who actually follow our laws, versus those who would break them. More importantly, I really do believe you should have the means of defending yourself, your family, and our country. I have spent my lifetime supporting the ideals that have made our nation great. I do not intend to stop that now. As for begging for money, that is exactly what I am doing. I assure you it is necessary, as there are well funded groups who would prefer I not return to Hartford. I have tried to be as direct as possible. If you would like more information on other issues, please email me or call me on my cell at 203-917-5027. Please consider meeting me in person on Thursday. Wow, so you’re THAT guy! I sent out quite a few emails to “my elected representatives” in the run-up to the new law and your name (like many others) I’ve forgotten since. But I do remember reading about you after the fact; the lone contrarian from Newtown. Good for you! Just a few words so you may understand where I’m coming from and the perhaps terse tone of my initial response to your email. I am a gun owner, but not a fanatic 2nd Amendment gun-nut cowering in fear of the tyrannical government. If the good people and the legislature of Connecticut genuinely think the world is a better place if I am only allowed to load 10 rounds into my pistol designed to hold 15, I can live with that and still have a fulfilling life. I am also not a single-issue voter; there is more to life than guns. I will not hold a grudge against anyone who votes their true conscience, however much I might disagree. So you may have already guessed that your actual vote on the matter is of lesser concern to me than your opinion about the abuse of procedural rules. What took place in Hartford those few days disgusts me to the bone. Though expected, I was really disappointed in how the Democrats hijacked the whole process in a way that surely violates the spirit and principles behind Emergency Certification. I used to be a registered Democrat, but since the debacle in question I have changed my voter registration to Unaffiliated. I imagine you and I disagree on quite a few things, but it is refreshing to encounter a politician who still possesses a spine and who dares to answer a direct question with a straight, no BS answer. You may be surprised to learn (or not) that most reply with a form letter at best, filled with empty blather. I hear you on the “begging for money” thing. You can’t play if you’re not in the game. Just let it be known that in my personal opinion money in politics is the single biggest factor hindering America from getting back on an even keel. I will therefore not attend your fundraiser (principle, nothing personal), but you can look forward to a small donation through your web page. Thanks for your replies, for taking the time to hear me out, and I hope you bear my thoughts and concerns in mind (surely, I can’t be the only one) wherever your political aspirations take you. For obvious reasons I won’t be voting for you in November, but nevertheless I wish you good luck (and I’ve never, ever, said that to a Republican before an election!). Lars, I hope this email finds you well! I am running for another term as representative in the State Legislature. While I am not your representative, I do represent Newtown. If you are happy with the job I am doing, I could really use your support. I am having a fund raiser at the Putnam House in Bethel this Thursday, May 22nd, from 6pm to 8pm. Please reply to this email with an RSVP or regrets. If you can’t make it, I have attached a contribution form that you could mail in, or you can use the link at the end of this email to contribute online. The maximum contribution I can accept is $100 per person, but any help you could provide would be greatly appreciated. Thank you for your consideration, and I look forward to serving you for another two years. Dan Carter, Connecticut State Rep. Thanks for contacting me on the matter of begging for my money. I’ve never heard of you and don’t know the first thing about the job you’ve been doing. Please help me make up my mind whether or not to part with my hard earned money for your benefit by answering the following questions short and to the point. Any attempt at evasive, vacuous politician speech will be dismissed and I will double my contribution and give it to your opponent regardless of who that might be. How did you vote on the changes to our gun legislation post Sandy Hook, and, regardless of how you voted, how do you feel about the manner in which the law was passed? Looking forward to your prompt and sincere reply. Lars Dahl, concerned citizen and voter. I will update when/if I get a reply.